Friday, December 22, 2017. Apply here. Data & Society is able to offer this resource free of charge thanks to the generous support of the John S. and James L. Knight Foundation. NEW: Future of Labor — Emergent disruptions in the labor force as a result of data-centric technological development, with a special focus on structural inequalities. The program begins at 9:30am and closes at 4:30pm. Coffee, breakfast, and lunch are included, with frequent program breaks to enable calls and newsroom check-ins. The day closes with a lively food and drink reception with Data & Society. Data & Society is located in Flatiron/Chelsea district of New York City in walking distance from the C/E, 1, 4/6, and F/M trains. Limited domestic travel stipends are available (see below). This diverse overview will give journalists and media makers the latest evidence-based research on the social and cultural effects of automated and data-centric technologies. This workshop is the first in a series of Data & Society events aimed at strengthening a network of media practitioners who are driving the public discussion around emerging technologies. Select session titles include Gaming the Algorithm, Data as a Gift, and When Humans Attack. The program is intended as a one-day tour of the most complex hot topics on the horizon for mid-career to senior media professionals covering this field. Spots are limited and the process is competitive. Please apply ASAP. Applications for this second workshop close on Friday, December 22. We especially welcome applications from press professionals who identify as members of underrepresented groups. Due to demand and holiday season capacity, we strongly recommend submitting your application early since we anticipate issuing select early acceptances. If you have any questions, please email communications at datasociety dot net. Note: Demand is high. 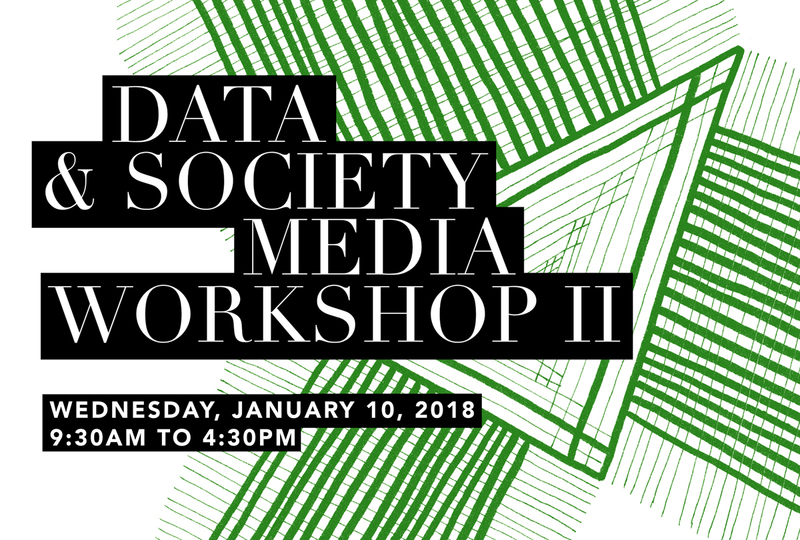 If you are on the waitlist for the December 13 workshop and wish to be considered for January 10, please email communications at datasociety dot net. You do not need to submit a second application. *While we appreciate interest from scholars of media, this workshop is intended primarily for practicing media professionals such as editors, correspondents, reporters, news division staff members, podcasters, and filmmakers. Select domestic travel stipends are available on a first-come needs basis to technology journalists residing outside of the New York City area, and for those with local transport accessibility needs. Please include such requests in your application form.